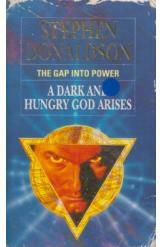 A Dark and Hungry God Arises Stephen Donaldson Sci Fi. Book is in good condition, all pages intact. Nick Succorso and his companions have fled the Amnions to the pirate shipyard of Thanatos Minor. The Amnions have already laid a trap for them there, however, and now they must deal with both these aliens, and the return of Angus Thermopyle, now a cyborg under UMPC control. Part of the Gap series.